Since reforming in 2011, The Darkness have been slowly pushing their way back into the public eye to help show everyone there is still a place for music to play air guitar to. The band last played Norwich in 2011, just after they’d reformed, as one of their three warm up shows before playing at Download Festival in Donington. Then after doing a few festivals around the world were asked to be the opening act for Lady Gaga’s European and African part of her ‘Born This Way Ball’ world tour, and judging by Monday nights performance they are back to their very best. The band had already announced in their press release that as it was the tenth anniversary of their biggest selling album Permission To Land that they would play the whole album, in it’s entirety from beginning to end, and they did as promised in the second half of the show. 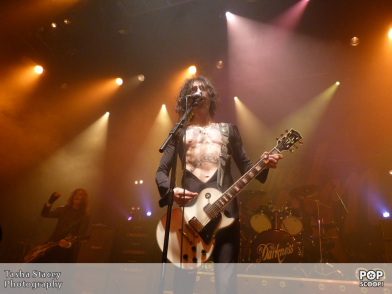 They came on to the stage with singer Justin Hawkins and Bassist Frankie Poullain dressed as extravagantly as ever. Hawkins in a black catsuit, donning what now seems to be his traditional aristocratic style moustache, and Poullain looking like what can only be described as a bass playing white Hendrix. The band kick off with new unreleased track Second Fiddle, a lyrical intro to who the band are and with both Hawkins brothers and bassist Poullain lending their vocals to the track. The track also has a feel of a tribute to the underdog about it as well. With a few shaky sound moments, the band continued on with their set with newer material such as, She’s Just a Girl Eddie, Every Inch Of You, and an absolute falsetto smashing rendition of Radiohead’s Street Spirit, taken from 2012’s Hot Cakes. They then finish the first half of the set with One Way Ticket To Hell And Back, the title track from their second album. Even though the crowd don’t seem too familiarized with this new material, they are still enticed and spellbound by the flamboyant rockers, and Hawkins climbing the speaker monitors also helps with this. Hawkins at one point though does describe the crowd as ‘watchy’ but he immediately explains that this is not an insult and he doesn’t care how the crowd reacts to their music, as long as they’re enjoying it. The second part of the show, is when The Darkness really start to shine when they play, as promised Permission To Land in full. The band emerge from their half-time encore, and a catsuit change from Hawkins, this time a black and white striped number, to a comedy parody of a story behind the album that goes down brilliantly with the fans. They then dive straight into Black Shuck and their first single taken from this album Get Your Hands Off My Woman, Hawkins still prancing around looking like a possessed zebra. They then move on to the two most successful tracks of the album Growing On Me and I Believe In A Thing Called Love, at which point crowd participation is at its fullest, singing along to every word and clapping in unison. In power ballad Love Is Only A Feeling everybody’s hands are up and swaying in typical power ballad fashion, if there wasn’t a law against smoking indoors now this would have surely been a lighters in the air moment as well. The band continue to pound through the album when they get to the two songs that will be most remembered from this gig. The first Friday Night which features Steve, a member of the crowd who for the whole evening had been heckling the words ‘Christmas Song’ at every possible opportunity. So Hawkins invites him onto the stage and in a pantominesque style of hero against villain asks the crowd what they would prefer, including that if they play the Christmas song it will be the last thing they play. Obviously Friday Night is played and Steve stays on stage and becomes the new dad dancing champion of the world. The second track in question Love On The Rocks With No Ice is when Hawkins and the band give their most explosive performance of the night. This includes the now customary ‘Hawkins lap of the crowd on a security guards back’, like a knight returning from battle to his army of fans, only armed with a Gibson guitar instead of a lance. The band then round off the evening with the last track on the album Holding My Own. Then the traditional encore before giving dad dancer Steve his wish and playing their Christmas song Don’t Let The Bells End, accompanied by three people dressed as Santas and ironically a Zebra. Hawkins recently said that the band are back together not to become huge again, but to do what they genuinely love doing as a job. On the evidence of this performance and rumours of a new album to follow, they may just get both of those things and return out of the darkness and back into the limelight.